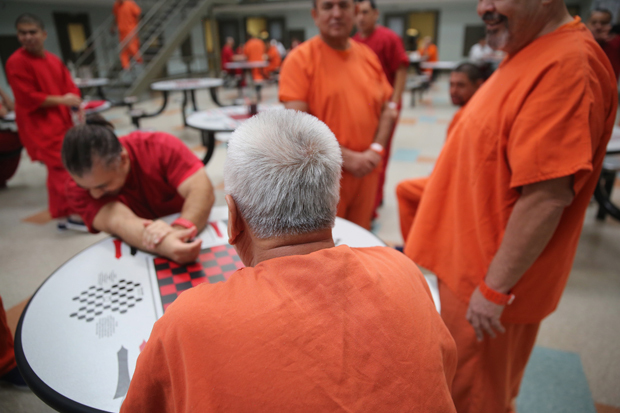 Detainees talk while in a general population block at the Adelanto Detention Facility on November 15, 2013 in Adelanto, California. The past 40 years have seen unprecedented growth in the United States prison system. Today, one in 31 adults are either behind bars or on parole or probation. These numbers have led to issues with overcrowding, fostered a boom in the private prison industry, and altered communities around the country. Bipartisan reform efforts have begun to reverse the trend in incarceration. However, at current rates it would take 90 years to bring the prison population back in line with other democracies around the world. We look at mass incarceration in the United States – what’s behind it and why it’s so difficult to address.